The Pulau Bukom refinery fire is finally out and fortunately with no loss of life. For Shell though, their biggest refinery is out of action, possibly for an extended period. Still a good outcome when one considers the fifteen lives lost and over 100 injuries in the BP oil refinery fire at Texas Cityin the US in 2005. If the explosion and fire had occurred onJurongIsland, home to nearly three times the refining capacity of Bukom as well as a host of other downstream chemical plants feeding off the refineries, the results could have been catastrophic. Much closer toSingapore a catastrophe there could have resulted in serious loss of life particularly if fires or exploding debris had hit the mainland. Nothing is known about the causes of the Bukom explosion. In Texas the explosion was caused by the failure of indicators to detect leaking hydrocarbons which were then ignited by a diesel engine that was left running in contravention of regulations. Here the initial indications are that the explosion started in the pump room and then spread. It is good that the government has announced so quickly that there is to be an inquiry into the causes of the fire though less explicable is the decision to have the inquiry conducted by the Ministry of Manpower (MOM) alone. Surely the National Environment Agency (NEA) should be involved as well. Even more alarming is the fact that the Workplace Safety and Health Commission, which will be investigating the fire, is chaired by none other than the Chairman of Shell. It would be hard to think of a more obvious conflict of interest! At the very least he should recuse himself and step down while the inquiry is in progress. Longer term, the government’s practice of appointing industry insiders to regulatory bodies should cease. In the sphere of public transport we have the Public Transport Council which is packed with representatives from the industry itself as well as the government and NTUC (which is of course a shareholder inSBSTransit). I was not the first to draw attention to this as back in 1999, JBJ in one of his Parliamentary speeches, bemoaned the fact that thePTCwas filled with industry representatives and included hardly any of the public who are the biggest users of public transport. This cosy relationship has certain discomforting parallels with Japan. In Japanlax regulatory oversight combined with a culture of secrecy and a cosy relationship between regulators and industry was a big contributor to the severity of the Fukushima Daiichi nuclear accident and to the deliberate downplaying of the environmental risks after the accident. However while in Japan the practice of regulators taking subsequent positions with the companies they regulate has been widely assailed at least it does not go as far as Singapore where the industry would appear to be responsible for regulating itself! All well and good, you might ask, but what has this to do with the “fat tails” of the title? This refers to the hypothesis that random events are normally distributed with 95% of possible events falling within two standard deviations from the mean and 99.7% within three standard deviations. 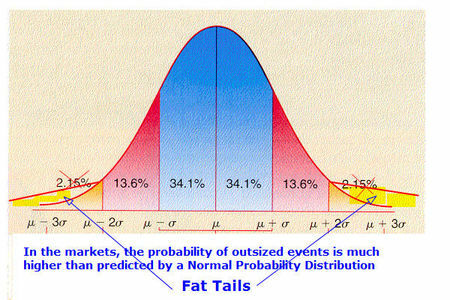 A fat tail means that the likelihood of an extreme event is much higher than would be predicted if events followed a normal distribution. The financial crisis of 2008 was so unanticipated because based on a normal distribution such events should only have occurred once every thousand years or so. Yet in practice they seem to roll around with increasing frequency. In fact hedge funds have been set up to try and take advantage of this discrepancy by buying what they perceive to be cheap out-of-the-money options. Their profit profile then becomes the opposite of most of the other financial players in that they are prepared to tolerate small losses over an extended period with the expectation of huge gains when these seemingly extreme events occur. And this is in fact what happened in 2008 with funds like the Black Swan fund associated with Nicholas Taleb. My point is that, even though the petrochemical industry in Singapore might have had a good safety record up until now, are the government aware of the potential risks of an extreme event of courting so much investment in a high-risk industry so close to a densely populated urban centre? Are Singaporeans aware of the possible downside? There is a reason why these companies choose to site so much of their petrochemical investment in Singapore and why the construction of new refineries so close to large cities would be a political no go area in the US or most other advanced countries. Our air quality is already in the bottom quartile among cities in developed countries according to the latest World Health Organization study (http://www.who.int/phe/health_topics/outdoorair/databases/en/) and strangely enough the only major city in theUS with an air quality as bad asSingapore’s is at the centre of the domestic oil industry (Bakersfield,California). How many Singaporeans do you know with adult onset asthma and allergies? These conditions are usually closely linked to air quality. Just as a trader who makes money by running more risk looks good until the market blows up, so we should worry that our government is pursuing economic growth at all costs by running unnecessary risks. Marginal investments which yield little economic benefit to Singaporeans in terms of jobs or tax revenues may be pursued with incentives that end up both being expensive for the taxpayer and pushing up the price of scarce inputs like land. For instance did the petrochemical companies pay for the land reclamation that created Jurong Island? I hasten to add that I have no special axe to grind with the petrochemical industry and I welcome foreign investment. However there needs to be a proper cost-benefit analysis and the results should be made public through a Freedom of Information Act. The government’s flawed approach is illustrated by the reasoning behind the euphemistically named Integrated Resorts which employ mostly foreigners and have high social costs (although my objections are not based on the criteria that lead others to seek a ban on moral or religious grounds). If the sole criterion for whether an investment is worthwhile is whether a business makes money, and that only in the short term, then why not liberalize drug-taking which would be a huge money spinner? “I agree that smuggling diamonds out in toothpaste tubes is a strong way to generate wealth for your clients and if it weren’t illegal, I too would love a piece of that franchise. (http://sonofadud.com/2011/09/23/gic-ubs-and-the-death-spiral-of-your-cpf-funds/).” In any case our government has always welcomed foreign leaders who might find it difficult to travel elsewhere, such asRobertMugabe fromZimbabwe who happened to be staying at theSheratonTowers when I was staying there, on one of his regular shopping trips. Most Singaporeans are aware now, thanks to my regularly publicizing the fact, that the lion’s share of Singapore’s growth did not come about by raising the productivity of our workforce but by importing foreign workers. The floodgates were opened to overseas labour, at great cost to the incomes of native Singaporeans, as our government courted raw economic growth with what appears to have been no evaluation of the external costs or their impact on our welfare or even, in the case of hazardous industries like petrochemicals, the underestimation of the risk of extreme events. This is still continuing as demonstrated by the government’s plans for a nuclear power plant in Singapore, ignoring the closeness to the urban centre (perhaps they will locate it on Jurong Island citing the potential synergies!). If the Pulau Bukom incident has drawn attention to the dangers of extreme events being underestimated and more generally to the need for a more transparent quantification of the costs and benefits of major investments, then it will have served a useful purpose. Call me an old cynic but somehow I doubt that this will happen. “Most Singaporeans are aware now, thanks to my regularly publicizing the fact, that the lion’s share of Singapore’s growth did not come about by raising the productivity of our workforce but by importing foreign workers.” Oh for crying out loud, get over yourself. You are far from being the only person who has been talking about the productivity issue – even the government readily admits that we have had a productivity problem. Get off your high horse. The PAP is favouring the rich and they give monetary credits to employers who employ retirees. They rather not give the money directly to retirees. The PAP does not care for Singaporeans as a “Father” does. This is “fostering” out their responsibility to the Singaporeans, out to “Guardians” (Employers) and having to compete with Foreigners who are not “Legitimate” residents in Singapore. My 6-week industrial orientation (many years ago) was Bukom’s Crude Oil Distillation Number 5 (still the largest distillation unit today) Control Station. Yes, SAFETY is paramount important. And I agree that the investigation of the matter should be neutral – leave no stone unturned, including the possibility (though very low) of existence of unskilled foreign workers. Good arguments. Such essays force readers to think rightly. A matured and responsible government will welcome critics who dare stand up for what is right, fair and just. The Israeli Knesset has 19 Parties sitting in it. Such is true democracy. Good to read these comments. PAPies are increasingly exposed as a party whose ruling elite continues to hide information from their citizens, take decisions without due consultation and when critical events happen, spin stories that hardly compliment the intelligence of the people. Please continue to inform the people of Singapore what the Government refuses to divulge and get us all ready to question what is going on in our country…..integrity, honesty and due diligence is sorely lacking in our CEOs and top brass these days.